When our PHP script is executed, it will mean that a HTTP request was sent to our web server and that the browser is waiting for a HTTP response from our PHP script. The meta data portion to tell the browser whether the request is successful, what content to expect, how to deal with the content and etc. Such data had to be sent to the HTTP client before the actual content. The contents portion which is what our HTTP client had requested for. This portion can be blank, for example, when a HTTP response with a 404 status code is specified in the meta data section. If not blank, this portion is where our PHP script writes what the HTTP client wants, for example, a HTML document, a photo, a text document and etc. Extending from the robot.txt example, I will create a separate PHP script on my web server to tell browsers to show their users a download dialog box to download the same robot.txt file. // Specify that our robots.txt is text document. The type of content to expect, via Content-Type. We tell browsers that robots.txt is text data. The way in which the content is to be presented to the user, via Content-Disposition. 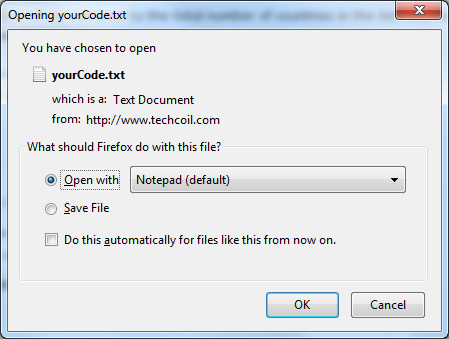 We specify that we want our browser to present the content as a file attachment to the user (thereby showing a dialog box) and to suggest the filename as robots.txt. After our PHP script provide the browser with the necessary meta information about the content, it proceeds to send out the contents of the file. To do so, it first locate the actual file by using the dirname function and the __FILE__ magic constant. It then reads the content of the file via the file_get_contents function and writes the content of the file via the print function.